I originally saw this idea on several places online relating to either Spring or Unicorns. 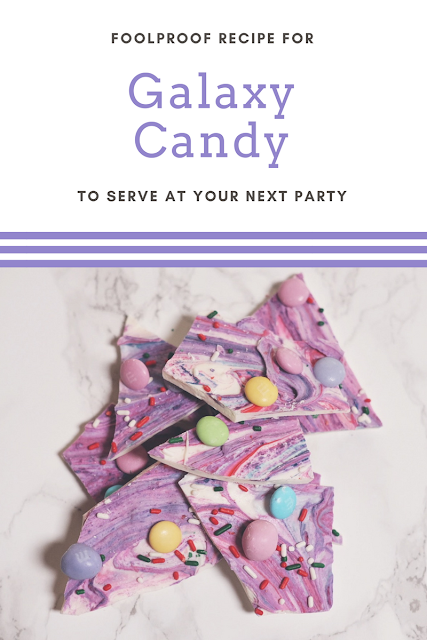 But really you can make this treat to go along with any holiday or themed party. It is really simple to make and you can use either the stove top or microwave. I've tried both ways and I feel like the stovetop is actually faster. You might want to use a double boiler method to melt the candy so it doesn't burn. Have all your supplies ready to go because once the candy melts, you need to work with it rather quickly before it starts to set. 1. Empty the candy melts into your pot or container to melt them. 2. On medium heat stir constantly until melted. If it is too thick add a teaspoon or two of olive oil to help thin the consistency. 3. Once fully melted pour onto the parchment line cookie sheet and spread out to a nice even layer the length and width of the tray. 5. Swirl the colors around with a fork or toothpick mixing them together and this will create a galaxy looking affect. I used a bright pink and teal. 7. 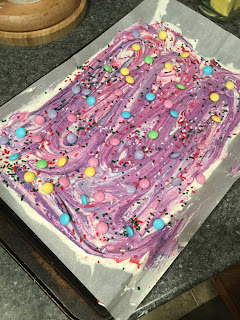 Add your sprinkles and candy across the tray onto your galaxy color. Use as little or as much as you'd like. 8. Place tray in refrigerator for 20-30 minutes. 9. Remove from fridge and break up candy into chunks of your choice. You can slice it if you'd like but it is more fun to break it into odd size pieces. Now it is time for your guests enjoy their special treat. I've seen some use it as a party favor in a decorated bag or even as a decoration on top of their dessert they are serving at the party. The design is completely up to you! 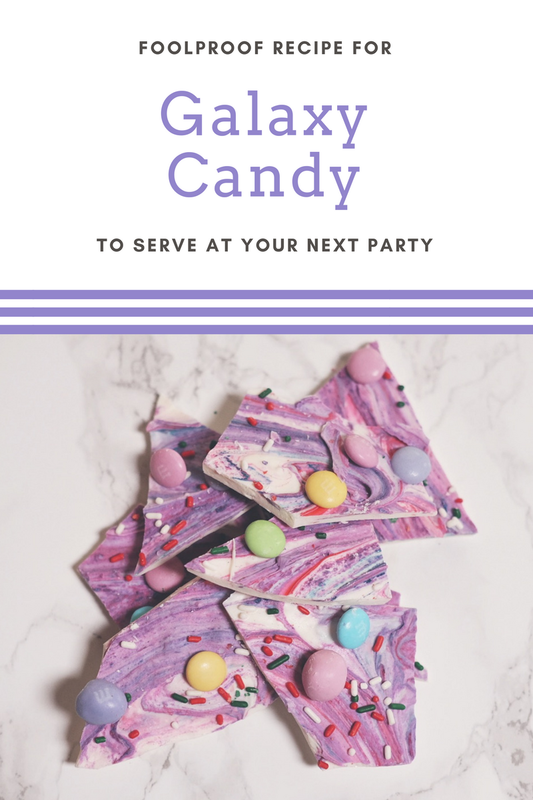 No two batches will be the same that's what makes this such a fun treat that is out of this world, or Galaxy! After I made the candy I melted some of it down and poured it over popcorn.